So I'm a little late with my Wednesday Wishlist this week, but still wanted to share it with you, even though it's Friday! Personally I love Christmas, even though as a retail worker, it's busy and stressful. Not to mention the crazy hours that shopping centres are open. But one of my favourite parts of Christmas has to be the gift packs that brands come out with! There are some AMAZING gift packs sneeking their way into shops. On Wednesday I went into Napoleon and saw the Christmas packs. I always love what they come out with, and this year is no exception. Last year was all about Luxe, and this year is all about the OWL!!!! Owl lovers rejoice! While there are so many great Christmas packs and specials (which you can see here), my favourite is the "Allure" brush set. I've recently fallen in love with Napoleon Brushes again and have been using my "Luxe" brushes that were last years Christmas brush sets. 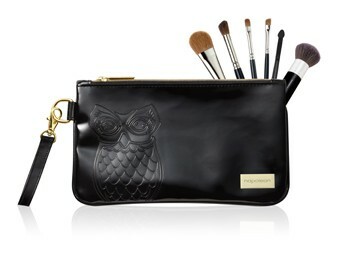 I adore the Owl make up case! It's so cute. The Polishing Brush and the Sculpting and Contour Brush are brushes that I'm missing in my current Napoleon collection. Have you started buying Christmas pressies yet?